The current craze of everything relating to the Volkswagen Type 2 Bus has been entertaining to watch. All but abandoned for scrap a few years ago and inhabited by penniless surfers, the Bus made an epic comeback of a proportion not matched except by this month's resurgence of the Cold War. Prices for 21 and 23-window Sambas (sounds like a dance you do at a South American state funeral - e.g. "Col. Avarez was honored with the traditional 21 window Samba salute, it took hours to clean up all the glass") have scooted out of the reach of those without proper funds. Today, we've got the Walmart version of the VW Bus, in more ways than one. 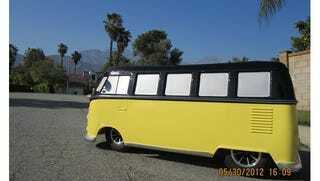 Find this 1963 Volkswagen Bus Scooter for sale in Upland, CA for $2,750 via craigslist. Do not attempt to adjust your TV sets. You are looking at a miniature Volkswagen Type 2 body mounted on top of a mobility scooter. The ultimate electrical powered accessory for the aged hippie on a budget. The Scootamba comes with an extra body and a stated 500 lb load capacity, so you have no excuse not to eat Sizzler every night. The stated 17-20 mile range will easily get you to Walmart, the nearest Social Security office, early bird special at the Home Town Buffett and back home before dark. Just be aware that operating a mobility scooter while under the influence of alcohol will be charged as a DUI in most jurisdictions. Originally posted as 1k: 21 Window Miniature: 1963 Volkswagen Bus Scooter on Daily Turismo. Image credits: craigslist.